Augmented reality (AR) has gained a great deal of momentum over the past 20 years. For anyone who’s been living under a rock, AR technology adds information to the user’s current environment, in order to make an activity or experience more meaningful. Early AR experiences such as Google Glass, the NASA Hybrid Synthetic Vision system, Japan’s holographic girlfriends (?! ), and Pokémon Go kickstarted the augmented reality market. Since then, interest in AR has spread further afield to domains such as education, marketing and the food industry. In fact, it’s estimated that by 2025, spending on AR in the healthcare industry will reach $5.1 billion. As this innovative tech increases in popularity, so does its capacity to deliver more seamless and intuitive user experiences. In today’s post, Justinmind explores five uses of augmented reality with great UX. Let’s take a look! For marketers, much of what they do requires them to be good storytellers. They have to be able to convince the user that what they’re selling is worth the user’s time and/or money. What’s great about augmented reality for marketing is that it brings product advertising to life. It alsoenables the user to interact with the product before parting with their cash. As Entrepreneur Europe puts it, augmented reality offers narrative potential – the opportunity to create immersive environments that invite user engagement. This allows marketers to build worlds that encourage the audience to participate and experience the product for themselves. Take a look at this great ad by Lipton Tea. The 360° video, promoting Lipton’s new “Magnificent Matcha tea”, takes the viewer on a delightfully sensual journey inside a cup of tea. This immersive experience makes you feel like you’ve dived straight into the cup and are exploring the dense, leafy, underwater world. You can even pan around the space within the cup up to 360° and explore different views. The combination augmented reality and motion graphics enhance the spatial reality further. This 360° experience feels so real, you can practically taste the flavor of the tea! Mmmm. Learn more about how augmented reality is changing user experience here. According to this ResearchGate study, augmented reality is now being used as a cognitive tool for educational and training purposes across subject areas in both formal and informal learning environments (such as schools, universities, museums and parks). Research by Shelton and Hedley reports that AR experiences enable increased engagement, increased attention towards tasks, and enhanced learning ability. We recently wrote about changes in technology and how to design for younger generations (link to millennial design post). Nowadays, 98% of millennials own a smartphone, spending up to 4 hours a day browsing the web, chatting on social media and playing games. If educators can leverage smartphone interest inside and the classroom, they could use augmented reality to enhance the learning experience. Check out the best mobile game designs right now! Take the augmented reality London Street Museum project for instance. In 2010, the Museum of London launched an iPhone app that allowed users to browse historical photographs in various parts of the city. The app would lead users to various locations around London using maps or GPS. 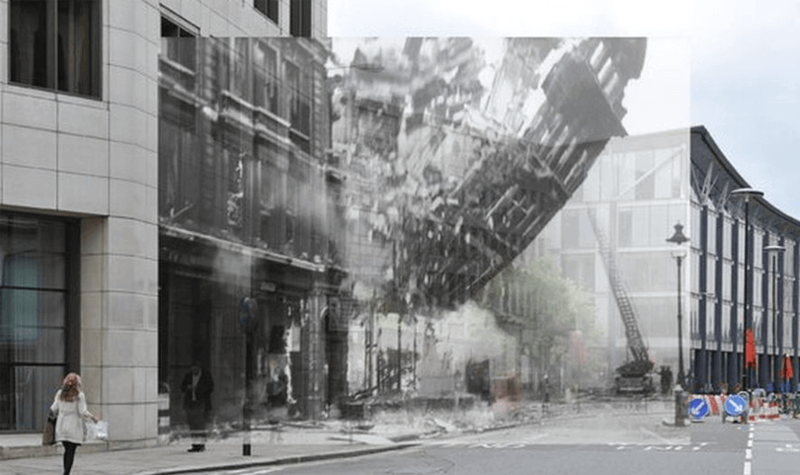 Upon arrival at a location of interest, a 3D view button would overlay a historical photograph over the live video feed, offering a brief glimpse into how the location would have looked in the past. Tomasz Oleksy and Anna Wnuk, who created a similar AR experience, argue that having a digital experience increases awareness about a place’s historical background, emotional attitudes and even evolving ethnic bias. What’s the 1st step to designing an awesome augmented reality app? An awesome prototype. But designers, AR isn’t just changing the products you create, it’s also changing the tools you use to design these products. Technology and business-side IT expert, Allan Behrens suggests that evolving design and development paradigms, which blend the virtual with the real, will make the tools we use much more practical. So how are augmented reality experiences going to impact designers? Cat McClintock suggests that they’ll affect two user interfaces: the software and the visual target. Here she gives the example of designing the interior of a tractor. Augmented reality will let the designer sit (virtually) inside the design they’re creating, allowing them to visualize their design assumptions and prototypes in a much more lifelike and meaningful way. Augmented reality has the potential to play a big role in improving the healthcare industry. Already, digital experiences are making improvements to a wide range of medical services – from training and education, to improving sight and determining whether patients are fit for procedures. AccuVein takes the sting out of having blood drawn. The handheld scanner projects over skin and shows healthcare professionals where veins, valves and bifurcations are found in the patient’s body. AccuVein’s Marketing VP, Vinny Luciano said the app hopes to reduce erroneous blood sticking for IV treatment, stating that 40% of IVs miss on the first stick. It’s estimated that the device has already been used on over 10 million patients, making the first stick 3.5 times more successful. 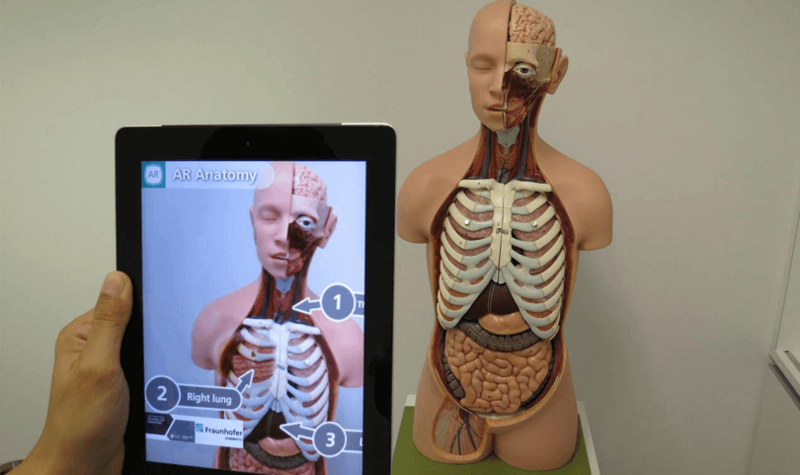 ARnatomy helps medical students learn terminology, using augmented reality to pinpoint exact body parts by layering additional information on top of the student’s direct view. AED4EU helps users seek out the closest automated external defibrillators (AEDs) so that patients can be treated for sudden cardiac arrest as quickly as possible. The app will provide the location and, wherever possible, phone number and address of the nearest AED. And last but not least, a slightly more palatable use of augmented reality: food! On second thought, why didn’t we start with this? Anyway, augmented reality is reshaping the food industry in a big way. You can already spot plenty of AR tech in food-related content, such as side-by-side cooking classes, portion control, wine bottles that, once scanned, prompt characters to give unique monologues, and food labels that provide ingredient information or offer rewards. But the AR experience that’s really taken off in the food business is 3D modelling. New York-based startup Kabaq operates at the intersection of AR and food, using advanced scanning technologies to create ultra-high quality 3D models. These 3D models are being used in restaurants to help diners decide what to eat. All you need is a smartphone with the Snapchat app installed. Tap on the Snapcode and the Snapchat app will open. Then, add the food in question as a “temporary lens” (the ones that last 24 hours) and take a photo of the food. You can then pan around the image for a 360° view of the dish, as well as zoom in. Tap the photo to view an infographic that explains the implications of each food choice, as well as listen to a brief audio commentary. Neat. Other uses for the Kabaq app include food presentation and delivery, catering menu displays and marketing – learn more here. The purpose of technology is to simplify our life, and augmented reality is no different. As hardware and software become more accessible, more and more augmented reality devices are becoming available. So, how will AR shape the future of UX design? Designers, that’s up to you! Got a favorite AR experience you’d like to share? Tell us about it here!